We are just two weeks away from WrestleMania 35, and the exhilaration is sky-high. The WWE Universe is eagerly waiting for the biggest wrestling event of the year. Considering only two episodes are left for RAW and SmackDown before Mania, WWE will be aiming to give a final touch before the Show of Shows. SmackDown has been offering remarkable episodes in the last few weeks, and it is likely to continue this week. 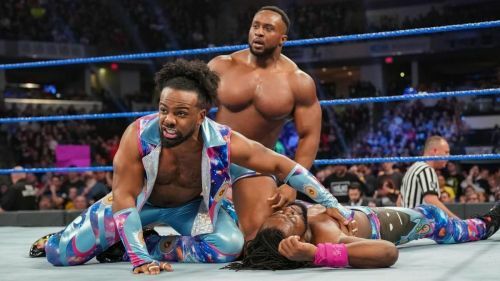 Kofi Kingston gave a jaw-dropping performance in the Gauntlet match last week as he defeated five superstars of the blue brand. However, Vince McMahon tricked Kingston, as Daniel Bryan dashed his WrestleMania dream. Charlotte Flair and Becky Lynch appeared on SmackDown Live as they skipped RAW last week. The two former best friends had a massive brawl after they appeared on Kevin Owens' Show. The Miz also cut one of the best promos in recent memory when he answered the challenge of Shane McMahon. The A-Lister is equally impressive as a face. Some unforeseen surprises might take place on SmackDown Live. Here we discuss four shockers WWE could be planning on SmackDown Live this week (26 March 2019). There is no denying that the feud between AJ Styles and Randy Orton has garnered plenty of attention from the WWE Universe. The two veterans of the squared circle are set to lock horns at the Grandest Stage of Them All. Orton and Styles will fight to prove their supremacy in the blue brand. It is definitely one of the most exciting non-title matches of WrestleMania 35. Orton participated in the Gauntlet match last week where Kofi Kingston pinned the former WWE Champion. However, Styles did not have any in-ring action last week, but he took a dig at Randy Orton in a backstage segment. Following the loss in the Gauntlet match, Styles might taunt Orton on SmackDown Live this week. Styles may brag about pinning Kingston in the Gauntlet match which took place on SmackDown Live last month. Considering the two men have been exchanging words in the last few weeks, they might put their hands on each other this week. We might see a gigantic brawl between the two former WWE Champions, which could fuel the rivalry.